No insulation? No problem! In fact, by challenging the conventions of magnet making, MagLab engineers created a first-of-its-kind magnet that has only just begun to make records. REBCO tape was wound without insulation into a compact magnet coil just 5 cm long. A team of scientists and engineers from across the MagLab joined forces to build the REBCO coil in less than a month. The REBCO tape used to wind the coil was .045 mm thick and 4 mm wide. The REBCO test coil reached 9 tesla in a 31 tesla background field. 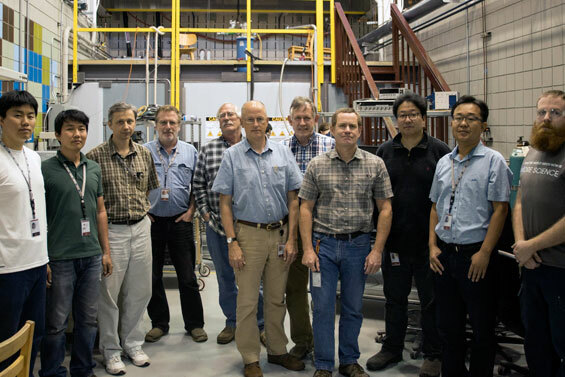 TALLAHASSEE, Fla. — Using a new approach to magnet making, engineers at the National MagLab have broken a world record for a high-temperature superconducting (HTS) coil operating inside a high-field resistive magnet. In the process, they have thrown wide open a new door to exciting advances in magnet making and magnet-related research. On April 7, a team led by MagLab engineer Seungyong Hahn tested a small but potent magnet made of rare earth barium copper oxide, or REBCO, which efficiently conducts electricity without any resistance at relatively high temperatures and magnetic fields. 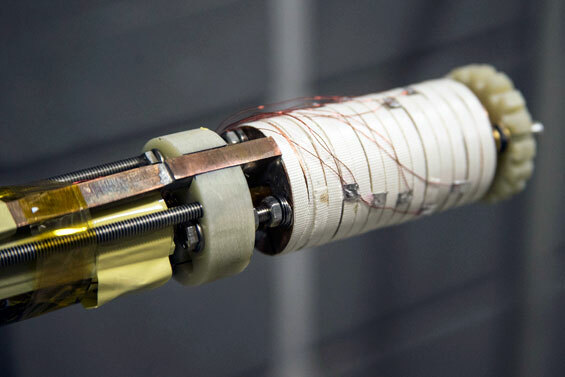 Putting the magnet coil inside one of the MagLab's strongest magnets, the team achieved a magnetic field of 40.2 teslas. (Tesla is a measure of magnetic field strength; a typical refrigerator magnet has a field of .01 teslas). The smaller coil's 9.2 tesla field combined with the larger magnet's 31 tesla field to generate the new record. In addition to eclipsing the previous record of 35.4 tesla, the test demonstrated the impressive potential of a new way of making high-field magnets, and the ability of the magnet material to continue to superconduct even in a very high magnetic field. Scientists use magnets to study materials, chemical compounds and biological processes, all of which reveal secrets when exposed to high magnetic fields. The high fields are created by running very large amounts of electrical current through conductors. Resistive magnets use copper and silver as conductors, while superconducting magnets use special materials that carry current with perfect efficiency, but usually only at very low temperatures. Either way, the more electricity used, the higher the field of the magnet. Using an inventive approach that challenged the conventions of magnet making, Hahn and his team were able to jettison extra materials that contributed nothing to the magnet’s field. Traditionally, magnet makers weave insulators between the conducting layers to direct the current. But Hahn, a professor at the FAMU-FSU College of Engineering, has pioneered a design that requires no insulation, allowing engineers to pack far more conductor, and therefore more current, into a smaller area. The result was a lean, efficient magnet that crams a lot of current into a compact package and delivers more than double the magnetic field-generating power per square millimeter than the previous record. 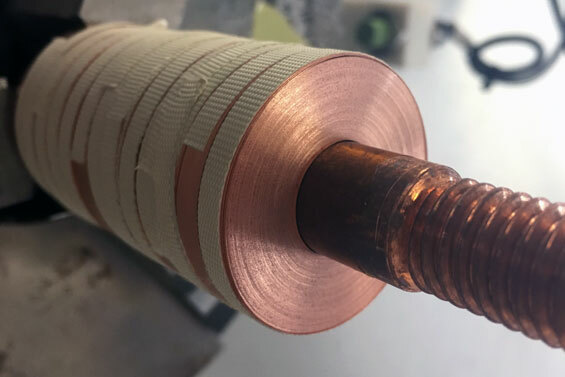 In fact, Hahn’s 5-cm-long, 3.5-cm-wide test coil carried 900 amps per square millimeter — a current density more than four times greater than the more traditional insulated REBCO coils used in the new 32 tesla superconducting magnet due to come online at the MagLab this summer. "With higher current density you can generate a higher field in a substantially smaller footprint," said Hahn. That's great news for MagLab Director Greg Boebinger, who would like to develop a far stronger successor to the lab's 45 tesla hybrid magnet, which has held the record for strongest continuous field magnet for 16 years. "The success far exceeds our expectations for this new design strategy, and that's cause for great excitement," said Boebinger. "It's a huge endorsement of this new no-insulation technology, which may be critically important to advancing other magnet technologies, including a future 60-tesla hybrid magnet." Certainly the magnet's design, which boasts a stronger conductor and better ability to withstand electrical damage than insulated magnets, was central to its success. But two other factors were critical to the project: the very latest in HTS superconducting tape and a highly-skilled team of magnet builders from the lab's Applied Superconductivity Center and Magnet Science and Technology Division. The superconducting REBCO used in the magnet came in the form of a thin tape that represents the cutting edge of HTS technology. 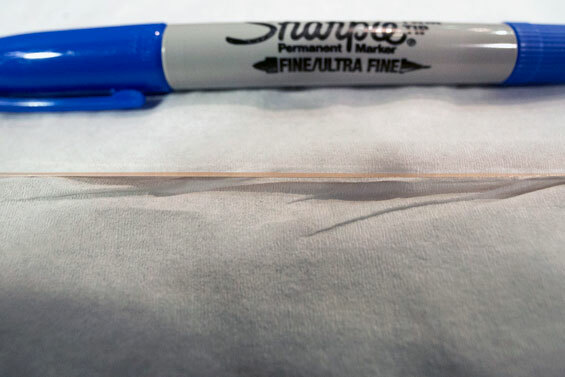 The result of a close collaboration between the MagLab and the tape's manufacturer, SuperPower Inc., the .045-mm-thick tape is considerably thinner than any previous product. Some 240 meters of the 4-mm-wide tape, wound into 12 coils, were packed into Hahn's extremely compact magnet. "Without this new conductor, it would have been very difficult to come this far," said Hahn. Incredibly, this first-of-its-kind coil was built in less than a month. "The people who wound and fabricated this never built anything like this before," said MagLab engineer Iain Dixon, who oversaw the magnet's construction. "This is just the first try. So we know it can be done better." And that is precisely what Dixon, Hahn and the other scientists and engineers involved in this ground-breaking work intend to do: Keep innovating until they reach the full potential of the material, which they are confident lies far beyond 40 teslas. "There's room for improvement," said Dixon. "Substantial improvement," chimed in Hahn. "Honestly, this is not even a magnet. This is a toy. More things are coming." The above group photo shows many of the scientists, engineers and technicians involved in this project. Left to right they are: Kwangmin Kim, Kwanglok Kim, Dmytro Abraimov, Jan Jaroszynski, George Miller, W. Scott Marshall, Ulf Trociewitz, Iain Dixon, Seungyong Hahn, Seokho Kim and Joseph Lucia. Not pictured are Lee Marks and David Larbalestier. Story by KRISTEN COYNE. Photos by STEPHEN BILENKY.